A VERY OLD SAYING WARNS, “Beware of Greeks bearing gifts.” Perhaps prudent 32OO years ago in ancient Troy, the advice is now seriously out of date, especially pertaining to Giota and Andrea Englisis bearing wine. Their Athenee Importers Third Annual Road Show recently crossed the US, bearing dozens of tasting samples from across Greece to enlighten us. We, of course, owe the Greeks a great debt. They were the conduit for the dissemination of what we call “civilization” through the Western World. Wine is one facet of that civilization. I cannot resist again quoting Thucydides: “the people of the Mediterranean began to emerge from barbarism when they learned to cultivate the olive and the vine.” Athenee is doing its part on the modern stage. Athenee Importers and Distributors, unusual in being run by a mother-and-daughter duo, has been a family company from its founding in 1974 by Anthony and Giota Englisis. Giota was born in Athens, Anthony and daughter Andrea in the US. 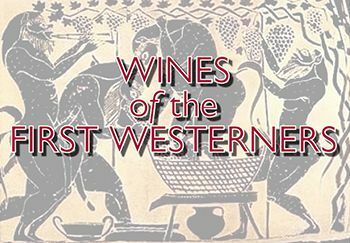 Then the first of American exclusive importers of Greek and Cypriot wines, spirits and beers, it has grown with the status of Greek wines, remaining the largest of its purveyors. Andrea, who joined in 1997, co-directs the firm with her mother. Anthony died in 1999. Based in Hempstead, New York, the pair personally selects wines from “family-owned and quality-conscious wineries from every region in Greece”. Athenee now imports about 28,OOO cases of wine annually. Greece is mountainous, largely volcanic. Vines usually grow above 3OO meters. The climate ranges from hot Mediterranean to alpine. Elevation, breezes and maritime proximity help temper the summer heat. Water is scarce. Although wine has been made in Greece for more than 6OOO years, it is only, for the most part, during the last 3O years that a critical mass of talent, training and finances have enabled products of export quality. A notable network of small wine estates, equipped with modern technology and operated by skilled and committed artisans, is sending us a fascinating array of tasty, moderately priced wines friendly to all manner of food. A total of 65O wineries draw from 87,OOO hectares of low-yield vineyards. Most are small holdings. Over 85 percent of wines use the many indigenous grape varieties. Nearly two-thirds of the wines are white. Gone are the one-note Retsinas and oxidized wines of the previous generation. More than a third are exported, many to China. I can foresee a time when you’ll be able to explore the aisles of Greece in your local wine emporium. EU classifications and Greek appellations are in a state of flux that can safely be ignored for now. Don’t be put off by the names of the producers and grape varieties. It’s best to keep a printed glossary of the latter. C is hard, as in “cat”; g is pronounced like the y in “yellow”; i like ee in “see”; sch as sk; x as z. Words are usually accented on their penultimate syllables. I shall close with an annotated list of the major grape varietals I encountered when tasting the Athenee roadies. You can explore these and others on your own time. Grapes more at home in Italy, France and Spain are also represented, but these will be familiar. AIDANI Usually blended with assyrtiko. Planted in Cyclades Islands, notably Santorini. Flowery and fruity; contributes aroma. ASSYRTIKO Highly favored and versatile, has spread widely from Santorini for dry and sweet wines. Subtle fruit, fine acidity and minerality. Ages well. ATHIRI Best grown at elevation. Used in blends, chiefly with assyrtiko. Best known in Rhodes and other islands. Aromatic and fruity. Low acidity. MALAGOUZIA Rare; mostly grown in the north. Aromatic, spicy, fruity, full-bodied wines. MOSCHOFILERO Pink skinned. Grown in the Peloponnese, best at elevation, for white or rosé wine. Crisp acidity. Aromatic: rose petal and spice. ROBOLA Highly respected. Grows at elevation, mainly in Cephalonia. Gives full-bodied, complex, balanced wines. RODITIS or RHODITIS Late ripening, pink tinged. Widely planted, particularly in Peloponnese. Good acidity and structure. Often used in blends, including in Retsina. SAVATIANO Greece’s most widely planted grape variety. The primary component of Retsina, which now tends to more acceptable balance and subtlety. Also used in other blends. Nice fruit, low acid. AGIORGITIKO One of Greece’s most planted varietals, primarily in Nemea and elsewhere in the Peloponnese and in Attica. A versatile grape producing balanced and flavorful wines. LIMNIO May be the world’s oldest recognized grape variety. Grown on the island of Lemnos and through the south of Greece. Gives a medium-bodied, spicy wine, which may age quickly. Usually blended. and used for sweet wine. MAVRODAPHNE Widely planted in northern Peloponnese and Ionian Islands for sweet wines and blends. MAVROTRAGANO Very rare. Grown primarily on Santorini, where it produces deep, complex, spicy, tannic, and slowly maturing wines.